A procedure is presented to facilitate a declaration that an area has not yet been invaded by a specific exotic insect pest following a trapping campaign to detect the pest species. For this we use a probability model to assess null trapping results and also a growth model to help verify that pests were not present at a given time in the past. The probability model is developed to calculate the probability of negative trapping results if in fact there were insects present, and then the hypothesis that insects are present can be rejected. The model depends on knowledge of the efficiency of the traps and also the area of attractiveness of the traps. If an incipient and undetected population does become established, then natural growth should eventually make it apparent. Using a growth model, the rate of increase of an insect population starting from one gravid female insect is calculated. 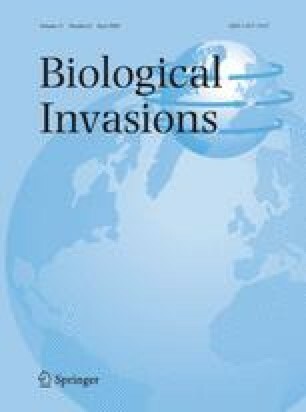 For both the probability model and the growth model, the conclusion that no invaders were present relates to some period in the past, the lag being defined by the time interval during the trapping activity or the time taken for one fertilized female to produce a population detectable by trapping. If no insects are observed after a suitable waiting period, then a conclusion can be drawn that none were present. The methodology is applied to hypothetical insects with discrete or continuous reproduction. We thank Vince Nealis, Les Safranyik and Imre Otvos for useful discussions and for providing literature references for gypsy moth.